After being retired from MI6, master spy, George Smiley, is approached by a senior government official. He is asked to uncover the identity of a Russian double agent who lies at the very top of the 'circus' - the British Intelligence Service. I am not sure how I managed it, but I came to watch Tinker Tailor Soldier Spy without any knowledge of the ending and with no plot spoilery baggage to carry. As a result, I was really gripped by the film’s mysteries, twists and turns. However, by the end, I realised one thing - it didn’t matter to me (or to my enjoyment of the film) who the mole was. Indeed, the big reveal was a bit of an anti-climax. Now, I don’t mean this in any negative way. It is just, for me, this film was less about the ending and more about the journey - and the interactions between the key players. Tinker Tailor Soldier Spy has the most amazing cast. You couldn’t wish for a better group of actors and it really is a joy to see them all on the screen together. I hope the casting director got medal for a job extremely well done. Even if spy dramas are not your thing, this film is well worth watching for the fabulous cast alone. They all give superb performances. I also love the atmosphere that is created this film. Director, Tomas Alfredson (Let The Right One In), creates the perfect canvas on which to set his spy drama. As the characters hide in the shadows, so do we. Every scene seems drained of colour and the sets appear stained by the amount of nicotine that is consumed. 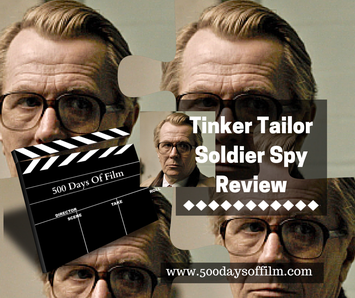 Tinker Tailor Soldier Spy is a brilliant film - whether espionage is your cup of tea or not. I just love Gary Oldman in this film. It never ceases to amaze me how he can disappear into the characters he portrays. I just found it hilarious that when the men at the top of the ‘circus’ meet they drink tea in these petite cups and saucers. Ah, old phones… how awesome are they! ?